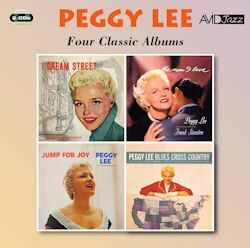 There are four bites of Peggy Lee’s apple here in a tight recording period of 1956-61. The arrangers are all chairmen of their various boards: Shorty Rogers and Sy Oliver, Nelson Riddle - on both The Man I Love and Jump for Joy LPs – and Quincy Jones. Typically cool and soulful, Dream Street features twelve cuts arranged by Rogers and Oliver and played by a largely West Coast crew. Street of Dreams sets the scene with effortless nonchalance. Stella Castellucci’s harp arpeggios irradiate What’s New whilst Larry Bunker’s vibes are to the fore in You’re Blasé. Things finally get up-tempo in It’s Alright with Me where Lou Levy plays an excellent piano solo. But in the main this LP showcases subtle pleasures: the flute sonorities that run throughout Too Late Now (Bud Shank) and the subtle, often genial arrangements that play to Lee’s obvious strengths. Perhaps the modish percussion of Something I Dreamed Last Night was a mistake, but Lee relaxes the tempo tellingly. The personnel listings have omitted the guitarist. The Man I Love album, arranged by Riddle and played by his orchestra, was one of the few occasions that Frank Sinatra conducted on disc. There are some outstanding instrumentalists in the ranks, though few solos. The string section is an important component of the session, as befits an album strong on romantic ballads. The big brassy end of Something Wonderful is an exception in its over-extrovert and echo-laden production. Her take on If I Should Lose You intrigues – cool, not serious, and warm not tragic. As noted solos are few; a muted obbligato trumpet on Happiness is a Thing Called Joe (Sweets Edison or Mannie Klein? Not sure) and a drearily straight trombone on There’s No Greater Love. Jump for Joy finds Riddle in altogether ballsier mood with a smaller orchestra and songs more conducive to up-tempo pleasures: maybe Sinatra’s penchant for ballads overbalanced the earlier session. In any case old classics such asWhen My Sugar Walks Down The Street rub shoulders withCheek to Cheek and Ain’t We Got Fun. Lee’s Back in your own Back Yard is very different from Billie Holiday’s – and shows her independence of musical mind – as is another number associated with Billie, What A Little Moonlight Can Do. A stand-out here, for orchestral sonority and vocal delivery, is Old Devil Moon. The brassiness of the backings laid on for Peggy Lee by Riddle and by Quincy Jones in the last album under review, Blues Cross Country, offers a striking conjunction; cool and sassy versus big-boned and sometimes raucous. Again, solo opportunities are almost non-existent in this album so those expecting to hear much from, say, Benny Carter, Buddy Collette, Bill Perkins, Frank Rosolino and Jimmy Rowles – out of a roster of many – will be disappointed. The backings are well crafted in this album, which functions as an American Travelogue, with visits to Kansas City, NO, LA, NYC, Chicago, SF, Boston, St Louis and other points of the compass. Appropriate compositions are threaded throughout the twelve tracks. Basin Street Blues is treated as a romantic ballad – ingenious, unexpected and it works - whilst there’s a loping, hard-swung The Grain Belt Blues and plenty of blues-drenched tropes to be encountered along the journey. Al Porcino steps out to take an obbligato trumpet solo on Goin’ to Chicago Blues – very different from Basie and Rushing, that’s for sure – and Fisherman’s Wharf, with superior lyrics and a great tune makes its mark: it was created specially for the album. To end there’s a shuffle dynamism to St Louis Blues . Though not always providing the subtlest of backings, this is another engaging album. The original sleeve notes are reprinted, as is overwhelmingly the case with Avid restorations. The sound quality is excellent.